A gorgeous skyline is the perfect backdrop for this elegant October wedding. The bride's not so bad either! 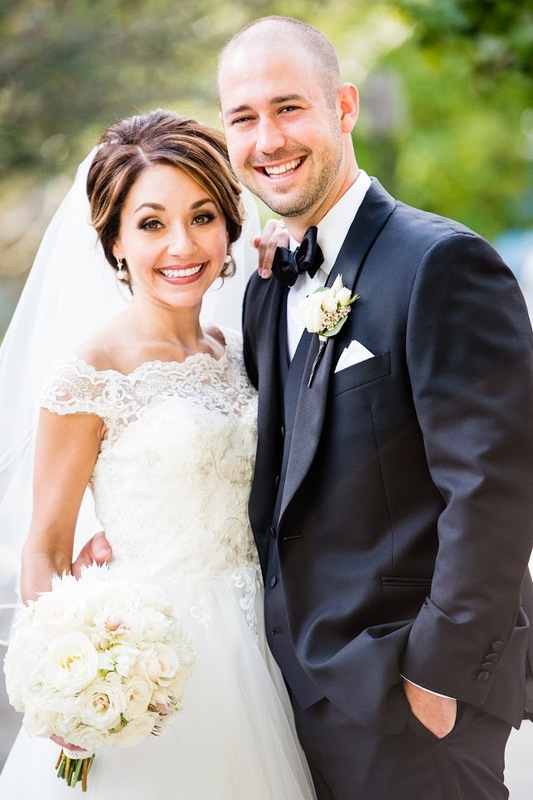 Abbey looked amazing in her off-the-shoulder Sincerity gown and Edward Berger veil! Before saying "I do", Abbey and her favorite girls got ready for the big day. Bambino International was there to capture the moment she got into her dream dress. Abbey married her husband Darek at the historical Cathedral Basilica in Covington, Kentucky. It was modeled after Notre Dame in Paris and man, is it gorgeous!! Just look at that architecture and stained glass! After the ceremony, guests headed to Drees Pavilion in Covington. We can see why they chose this venue. 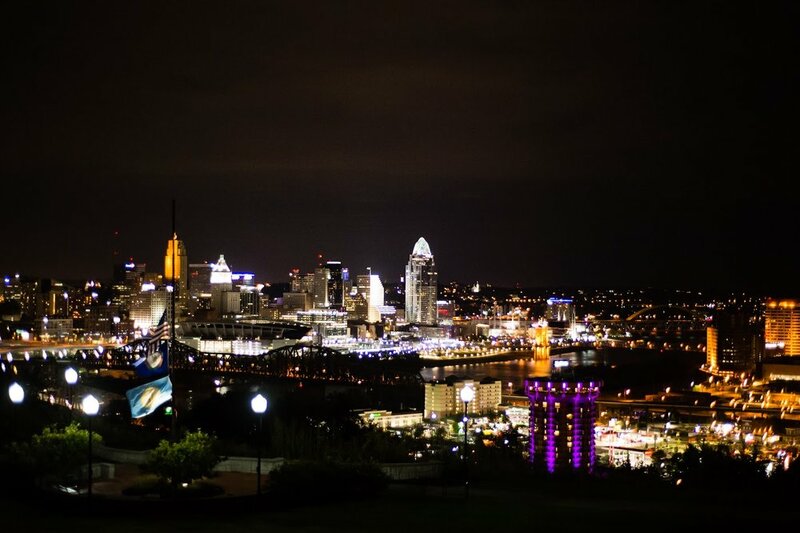 It has some pretty breathtaking views overlooking the Cincinnati skyline! Abbey chose candelabras and fresh florals for her centerpieces. The results were nothing short of beautiful! Isn't that just gorgeous?? The decor was so beautiful! We've seen their wedding, now let's get to know these two a little better. "We met in Lexington, Kentucky. Darek was in his fourth year of medical school, and I was completing a year of post-graduate pharmacy residency after graduating from Purdue. We both ended up on the same internal medicine team for a rotation. I can still remember every detail about the day we met; there was instant chemistry when we first shook hands! I had written my cell number on the board in our team room, in case anyone needed me when I wasn't in my office. Darek took my number off the board and texted me after a couple days of working together. We went on our first date the following week (pizza and beer over a Bears game), and the rest is history!" "We went to Siesta Key on our first vacation together, a place near and dear to Darek and his family. Our one-year anniversary was during the trip, so we celebrated with dinner at a beautiful restaurant named Cafe L’Europe. Fast-forward to two-and-a-half years later when we were back in S.K. on vacation. Two of my best friends were coming down to meet us for half of the week, and Darek suggested we go back to our special place, Cafe L’Europe, to have a nice dinner before they arrived. After an amazing meal, the waiter brought out dessert. On the plate was a raspberry sauce that spelled out, "W.Y.M.M.?" I stared at it puzzled for a few seconds, and as it was all beginning to sink in, Darek was getting down on one knee and asking, Will You Marry Me?!" STOP! That is so cute! Was Abbey surprised? "I was in complete shock!!! It was one of the best days of my life! I sobbed like a baby and couldn't stop smiling. We were seated outdoors on a terrace, so people were clapping and cheering. Darek was really sweet and hired a photographer to be in the area and capture the moment, and his dad came and videotaped the proposal from afar as well. I had NO clue this was going on!! After a glass of champagne and some celebrating, we went over to the park across the street and took engagement photos. What made it even more perfect was getting to celebrate the rest of the week with my best friends that flew in the next day." When it came to wedding planning, what was Abbey's fav part?? "Everything!! Just kidding. But I could honestly say almost everything. I just really enjoyed the process! Narrowing it down, I had three favorite parts: 1. Finding my dress. It was the first event that made everything so real, and it was a really special moment for me and my mom. 2. Finding our venue. My mom and dad were with me and we just knew it was the right place the second we walked in. It was such a cool feeling to think, “This is it!” 3. Tasting food with our caterer. This was something Darek was most excited about, and he put a lot of thought into it. It was a fun experience for us and our parents, and getting to know our caterer was nice- he’s a really neat guy!" "Registering. That might sound crazy to some people, but we were about to be 30 and had each had lived on our own for a while. It was hard to come up with things we needed at first. We had to think outside the box more than we had anticipated!" The big day had finally arrived. What was Abbey's favorite part of her wedding? "Dancing with everyone! There is nothing that can describe the feeling of being out on the center of the dance floor with your new husband, encircled by family and friends, with everyone singing at the top of their lungs. It was pure, absolute joy! If I could bottle up that feeling, I would!" "It's important to remember that a lot of loved ones in your life are putting effort, time, and money into making your day perfect and making you feel special. The day is about you and your new husband, but a little bit goes a long way when it comes to expressing gratitude. Take the time to hug and greet everyone. Hand-write your thank-you notes and say meaningful things in them! People notice and appreciate these things. When making decisions, try to think back on weddings you have attended and what things you actually remember about them. I didn't feel the need to have the most expensive programs or invitations or flowers, because these were things I didn't remember from a single wedding I had been to. I did remember the food, the dancing, and the fun, so we made these priorities!" We are SO happy for you, Abbey! We wish you and Darek a beautiful future together!! Check out more of the Sanford's gorgeous wedding day in the gallery below!